PURSUE A LIFE DEVOTED TO THE PRESENCE OF GOD Did you know that you have the same access to God the Father that Jesus has? 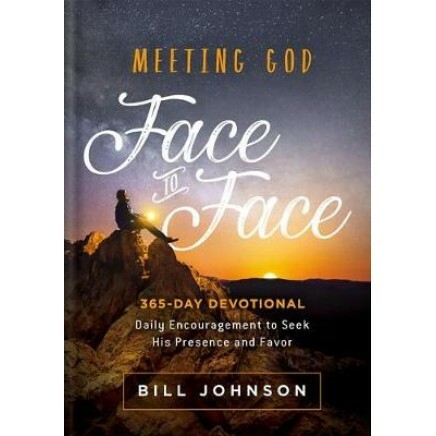 Meeting God Face to Face is a 365-day devotional based on Bill Johnson's best-selling book Face to Face With God. Each day's reflection contains a Scripture verse, a short reading, a highlighted point to ponder, and lines for journaling. Much of the content of this devotional and its companion book, Face to Face With God, was first preached by Bill Johnson in 2002. This message became his whole life--a life devoted to discovering and hosting the presence of God. Pursuing this goal has been costly, but it did not prevent him from making it his sole reason for living. If you desire to grow in intimacy with God and develop a stronger sense of and appreciation for His presence, this book is for you! Deepen your relationship with God by pursuing His favor and continuing the spiritual journey you started through Face to Face With God.